Sunday Leo told the minister about the pond he dug in his front yard and that he built bridges and dams and got his cows stuck and went on for an uncomfortable amount of time during the children’s sermon. 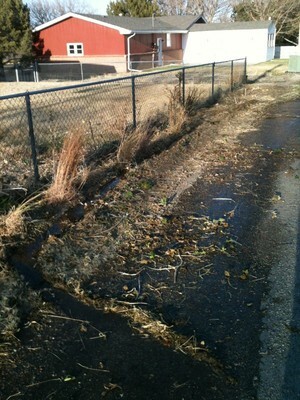 The minister was most impressed that he had a pond in the front yard. I have a spot in my flower garden which gets no sun. 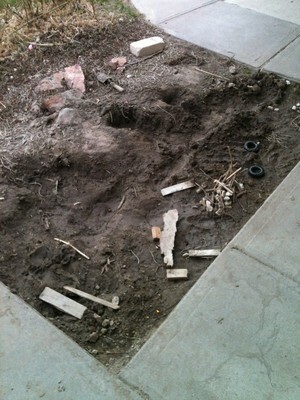 I could plant impatiens there or I could let the gentlemen dig. Leo and Paul’s mud hole Monday. Leo and Paul’s mud hole Tuesday. After three dire warnings of blizzards this winter which amounted to about 2 inches of snow total we finally got hit. 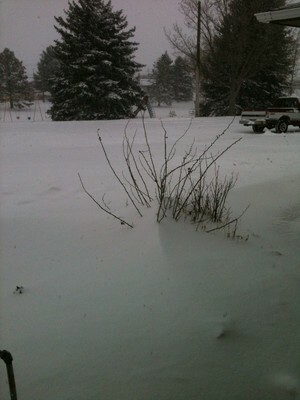 We got 11 inches, and about an inch or so of moisture. The kids got two days off from school, and I even got a snow day! Eleven inches of snow in November will probably be around in March. Eleven inches in April is great, and we need the moisture so bad. The second day I left Ed in charge, and I worked from 10-8. 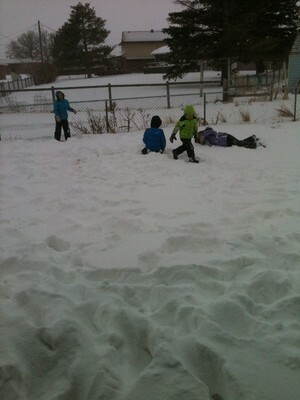 The kids left the house at 8:30 with their sleds. Ed said they stayed in the park for a couple of hours. I was delighted that everyone was still speaking to each other at the end of 10 hours together and the house was not noticeably worse that when I left. This is the back yard halfway through the storm. We live across the street from a seven acre or maybe ten acre park. It has a baby hill for timid sledders and a great hill known as “Suicide Hill” which it probably would be on a bike, but it is perfect for sledding. Everyone in town drives over here to sled. 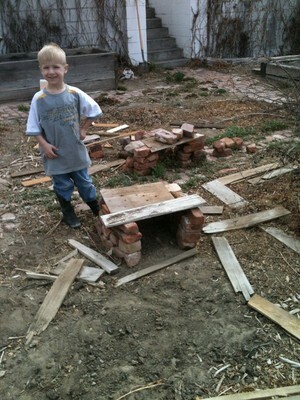 Last Wednesday Paul built garages in Grandma and Papa’s alley. I was so proud of myself last weekend. I am trying to get some native stuff to grow in the alley instead of the hollyhocks and bulbs that tend to look ragged as the summer goes on. I have several grass clumps out there, (side oats grama, little bluestem, switchgrass) you can see them in the background of the kids in the snow (and some asters I still plan to kill). 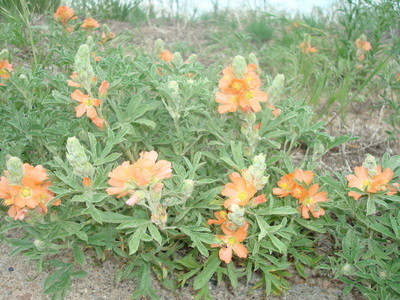 I found some seeds from my very favoritest flower of all time ever, scarlet globemallow. I have had no luck getting the darn plant to grow in the past, but now I have the right soil, so I have been watering my seedbed and watching the water drain down the alley. 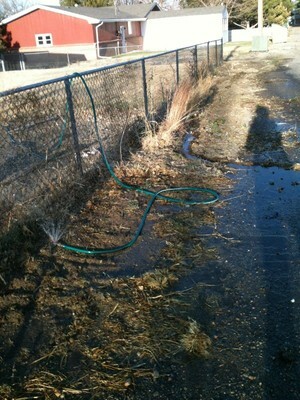 I got my hoe out and started some gravity irrigation. I am gonna have to build up my dam every Wednesday after the garbage truck smooshes it, but otherwise it should work okay for a couple of years until everything is ready to survive on rain (or the lack thereof around here).